"Bob Sima is a dynamic performer whose grace and power on the stage are as engaging as the songs he writes. His star is rising ever so fast, hire him now before you can't afford him." Bob Sima literally burst onto the singer-songwriter scene after taking a hiatus from his band Stereopool, a highly successful acoustic power trio from the Annapolis, MD area. Stereopool has made a name for themselves in the local and regional scene for their brand of energetic, evocative acoustic power folk music. They shared the stage with NRBQ, Eddie from Ohio, Ari Hest and many local legends and landed a UK distribution deal with Smart Choice Music (Kathleen Edwards, John Prine, Lyle Lovett) and were featured on the Smart Choice Sampler which landed them in Maverick Magazine. November 2006, Bob released his first solo release entitled POUR IT ON. It was produced by David Weber in Bloomington, Indiana (Krista Detor, Carrie Newcomer) and was quickly named "CD OF THE YEAR" by the former Westside Café. Pour It On is an amazing collection of songs captured "in the moment" with a very live feel. Bob's song "Amazed By You" has landed him in the top 1% of all time in the Acoustic Genre at GARAGEBAND.COM. He has also reached #2 ALL-Time in Male Vocals (Acoustic). His music has won awards from Songwriteruniverse.com, has been webcasted, podcasted and beamed through satellite radio waves. 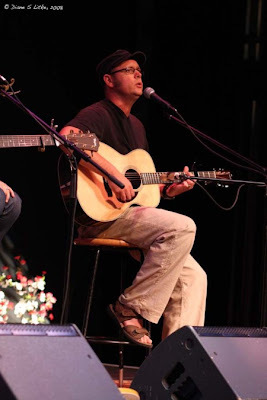 Bob has played many of the top venues in the mid Atlantic including Rams Head OnStage, IOTA, World Cafe Live, Fletchers, Cellar Stage, Columbia Lakefront Concert Series, Dewey Beach Music Conference and the National Folk Alliance Festival and Conference, Falcon Ridge Folk Festival and the Susquehanna Music and Arts Festival. Bob is also a highly sought after house concert player and has played dozens of house concerts all across the country. Bob also hosts and books a singer songwriter in the round at the Austin Grill in Rockville, MD.